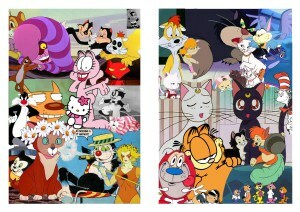 From the fighting friends Tom and Jerry to the loveably lazy Garfield, the myriad of cats representing human behaviour in cartoons and in real life is so varied; there is literally almost a cat for every feeling, action and emotion. These anthropomorphic representations in cartoons (which are undoubtedly important conduits in teaching us the basic principles of right and wrong) make light of violence and misdeed and teach us the basic stereotypical characteristics and aesthetics we can start to apply to the world. We also apply them to the people around us – be that in our best interests or not is definitely not my place to say. However, it is fair to say that these catty creatures are definitely part in parcel when we try to understand and make sense of the world around us. Cartoons are funny things, eh? So why cats? This conglomerate of character and principle describing humanity’s ins and outs are all tied together and realised by using our furry, little friends as one of the world’s relatable and real vessels. Is it possible that their history of being familiars and of understanding basic human interaction make them the best comedians, villains and storytellers? Or is it our domesticated relationship and our projected personalities we relate to? After all, Meg and Mog taught me about friendship and kinship as a child, which was instilled in me further when I watched Kiki’s Delivery Service. Perhaps this was due to my own circumstances leaving home and not really knowing what was going to happen, thus I found a personal solace in the relationship that Kiki and Jiji shared, but if I did, then I’m sure others did too. Maybe it is easier for us to understand difficult relationships when we are presented with a conduit for us to suspend our disbeliefs, and rethink them through cats’ eyes? Tom and Jerry, ever the rivals share a complicated relationship, and in hindsight explain and represent the difficulties in friendships through humour, which has mirroring in Groening’s Itchy and Scratchy which also extends and captures the ridiculousness of it all. Similarly, look at Top Cat and O’maley, the lovable rogues always getting one over on the protagonists and becoming our underdogs, demonstrating the hardships of not having a lot and camaraderie. The beloved companion Dina to Alice in ‘Alice in Wonderland’, ever patient with her insistence on “…let’s pretend”.